Around the Studio I wasn’t the only one thinking about fielding another Warsaw Pact force. Like myself with the Poles, Chris had become interested in doing a Czechoslovak force using the East Germans from Volksarmee for his force and formations. As I’d already started looking at the Poles, we added the Czechoslovaks to the project. Conveniently, along with the East Germans, the Poles and Czechoslovaks make up what is known as the Warsaw Pact’s “Northern Tier” by NATO and are the most prominent Warsaw Pact nations to be facing the NATO forces in West Germany. The Czechoslovaks’ recent history with the Soviets had been rocky. The liberalisation movement of the Prague Spring was supressed in 1968 by a Warsaw Pact invasion, followed by the reforming government being replaced by a more hard-line communist faction. There is some debate on how this may have impacted the performance of the Czechoslovak armed forces in any future war, but generally by the mid-eighties the army had recovered. However, there was general unwillingness among the people to support an aggressive war against the west, but they were willing to fight if their country was threatened. To reflect this we have given the Czechoslovaks the following stats: Courage 5+, Morale 4+, Rally 5+, Skill 4+, Assault 5+ and Counterattack 5+. They are not nearly as aggressive as the Poles or Soviets. However, they will fight quite well defensively, but will be more willing to give ground than to hold out stubbornly. The Czechoslovaks can field four different formations as well as the full array of Warsaw Pact style support. There are two types of Tank Formations, you can either take a T-55AM2 or T-72M Tank Battalion. Both these models are available in plastic, and the Czechoslovak T-55AM2 is identical to the one used by the East Germans. The T-72M just uses the standard T-72 plastic kit. The Czechoslovaks also used BMPs, which they also made under licence, and all the motor infantry of the tank divisions were mounted in BMP-1s or BMP-2s. There troops are organised along standard Warsaw Pact lines with mix of recognisable Soviet weapons like the RPG-7, and some unique Czechoslovak equipment like the vz. 58 assault rifle and RPG-75 (instead of the RPG-18), though in 15mm scale these look much the same as their Soviet equivalents. The infantry not mounted in BMPs can take the Czechoslovak OT-64 armoured personnel carrier. This 8x8 armoured transporter is bigger than its Soviet equivalent, the BTR-60, and is similarly armed and armoured. 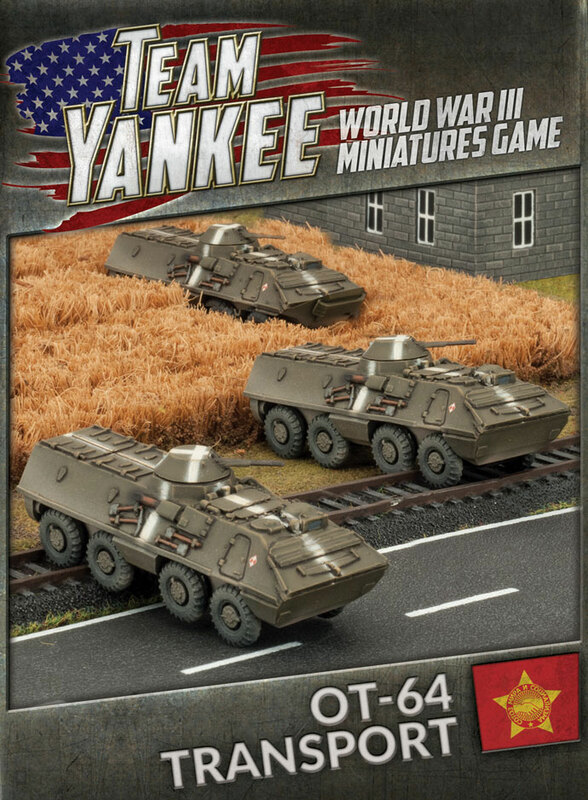 Support options includes many of the familiar Warsaw Pact units. However, there is some different Czechoslovak equipment options. 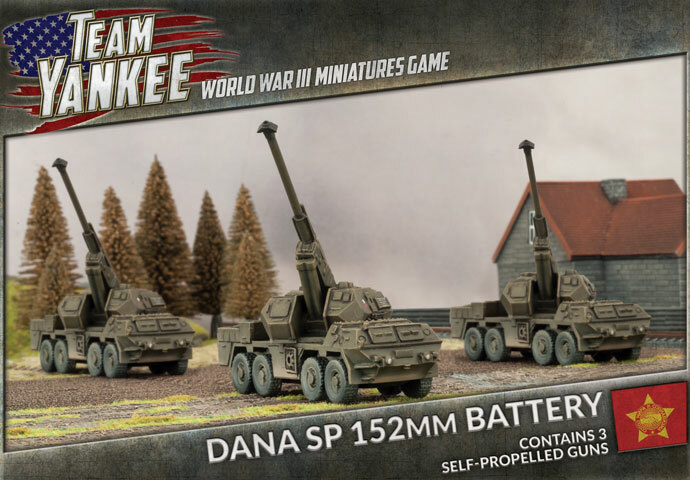 For heavy 152mm artillery they use their own DANA SP 152mm Artillery Battery. The DANA is an armoured self-propelled artillery system mounted on an 8x8 truck. The armoured turret is fitted will an auto-loaded 152mm gun-howitzer. The DANA has the Autoloader rule, reducing the score required To Hit Teams under the Template by 1. Another unique weapons system is the RM-70. 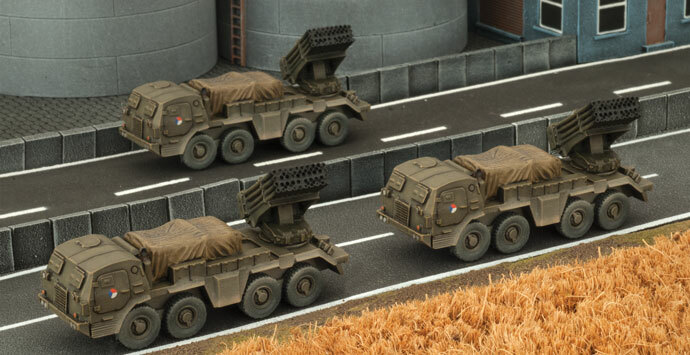 It mounts the same rocket launcher as the Soviet BM-21, but instead of being on an Ural 6-wheeled truck, it is mounted on a Czechoslovak 8x8 wheeled truck with an armoured cab. 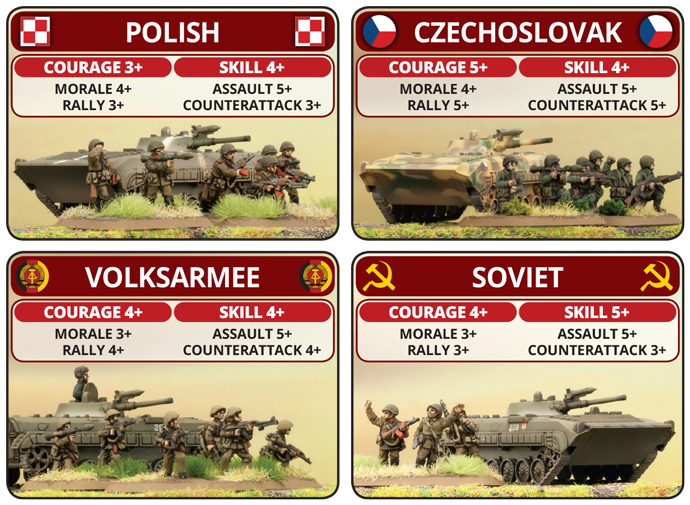 The booklet will come with a pack of Czechoslovak Unit cards much like West German Panzertruppen and Soviet Afgantsy booklets released previously. 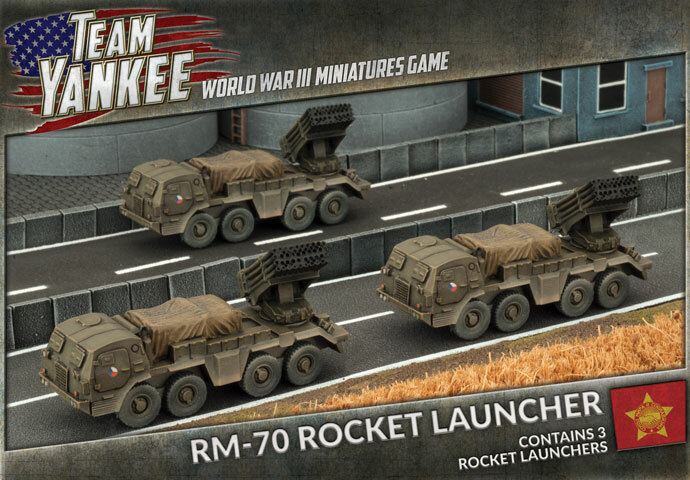 We have three new models for the Czechoslovaks, the OT-64 armoured personnel carrier, the DANA 152mm SP Howitzer, and the RM-70 Rocket Launcher. 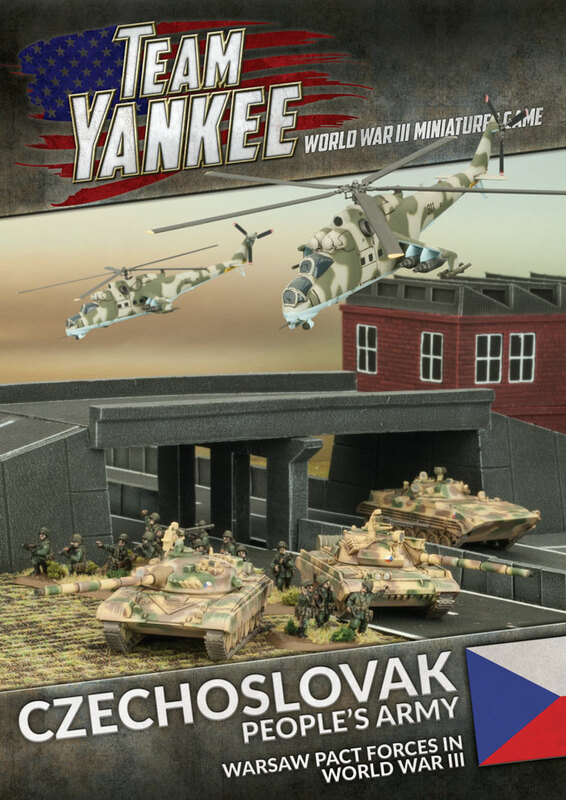 Other models used for the Czechoslovaks come from the Soviet Team Yankee range and the booklet comes with a catalogue of products for easy reference. It is worth mentioning that though we recommend using the Soviet infantry range to represent your Czechoslovaks infantry, you could also use the Syrian and Egyptian infantry from the Fate Of A Nation miniatures range. These are lightly equipped with Warsaw Pact style weapons and webbing, making them a good choice to represent Czechoslovaks in summer kit. The FOAN range is on sale at the moment and you can find them in the link below on the Fate Of Nation Store.